Bit of an exciting time at present as Frozen Skies finally comes together. So the main topic this week is the timeline for Frozen Skies' release. Additionally, I'll talk about future plans which include future products, etc. Working through Kickstarter fulfillment at the moment, hoping to get print copies out to backers in the next week or so. Couple of weeks after that Frozen Skies should be going on general release (roughly late June/early July time). Initially selling through DriveThruRPG/RPGNow, but I am looking at options to get Frozen Skies into stores. I'll post details on this as it develops. 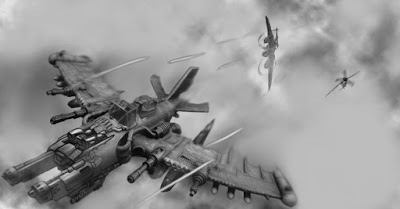 The next book for Frozen Skies will be Skies of Crimson, which'll have a focus on sky pirates and airships. After that, I wish to explore the world of Darmonica in more detail. This means the possibility of other books covering different parts of the setting. There is meant to be a new version of Savage Worlds due out later this year, though as I understand there isn't going to be major changes. I may end up doing an errata PDF for Frozen Skies if anything needs updating for the new edition, it just depends on what actually changes. Ran a poll recently on social media asking what people wanted to see next out of the various setting ideas I had. I've listed the settings below in order of popularity. What I'm considering doing is producing demo-kits for these settings, which will most likely be Pay-What-You-Want PDFs. This would allow me to get something basic out for the setting and then see how well each one does.